Through the Dalhousie Arch at the entrance to the village, the long, wide and ruler-straight main street is lined with neat 19th century buildings, now doing a roaring trade as gentle teashops and antique emporia. The original village (identifiable from the cemetery and surrounding grassy mounds) lay immediately to the west of the wonderfully explorable red sandstone ruins of Edzell Castle, itself a mile west of the planned village. 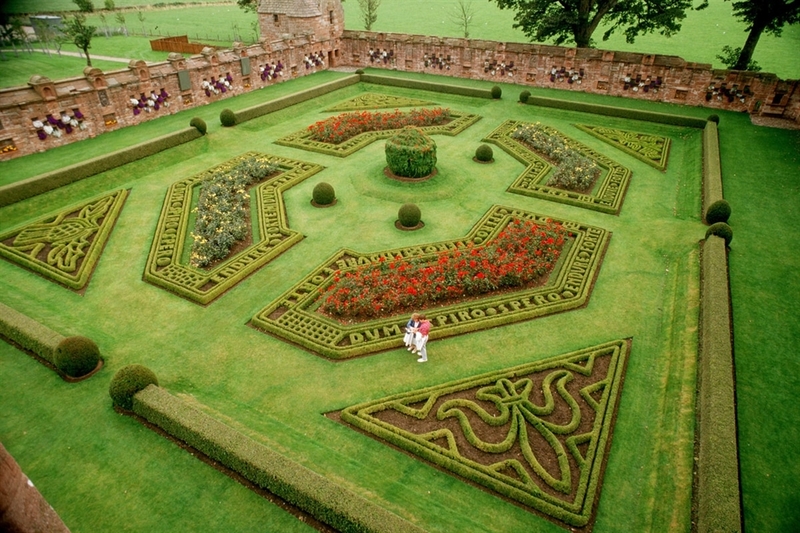 The square tower is the most notable feature of the beautiful walled renaissance garden, known as the Pleasance, which dates from the early 17th century. The chequered arrangement of blue and white lobelia in the wall recesses reflects the heraldic colours of the Lindsays, and the dwarf box hedge borders are cut to give the family's mottoes. The village also offers picturesque riverside walks through spectacular scenery from Gannochy Bridge to the Rocks of Solitude, where salmon leap to reach their spawning ground. VisitScotland, all rights reserved. VisitScotland, all rights reserved. VisitScotland / Paul Tomkins, all rights reserved. Two small figures consult a map, standing in a beautiful formal knot garden VisitScotland / Paul Tomkins, all rights reserved.